투투 출신 가수 겸 쇼핑몰 CEO 황혜영의 결혼 2주년 기념일 사진이 공개돼 화제를 모았다. 지난 24일 황혜영은 자신의 페이스북을 통해 “2013. 10.23 결혼2주년, 외출금지인 배불뚝이로 인해 아주 조촐하게 기념했지만, 행복한 시간”이라며 “예쁜 카드를 준비 못했다고 A4용지에 빼곡하게 써준 남편이의 손편지, 눈물 찔끔. 늘 마눌이 젤 먼저라고 해주는 둘도없는 내남편”이라며 마음을 전했다. 이어 “당신이 내 남편이라 고맙고 곧 태어날 아가들의 아빠라는게 얼마나 감사한지 사랑하고 사랑하고 사랑합니다”라는 글과 함께 사진을 게재했다. 공개된 사진 속 황혜영은 남편과 함께 얼굴을 맞대고 카메라를 응시하는 등 케이크와 편지, 결혼액자 사진을 올려 서로에 대한 변함 없는 애정을 드러냈다. 특히 쌍둥이 임신으로 7월째에 접어든 황혜영은 잠옷차림과 화장기 없는 민낯에도 불구하고 뽀얀 피부와 청순한 미모를 자랑해 시선을 사로잡았다. 한편, 황혜영은 지난 2011년 10월 민주통합당 전 부대변인 김경록과 백년가약을 맺었다. 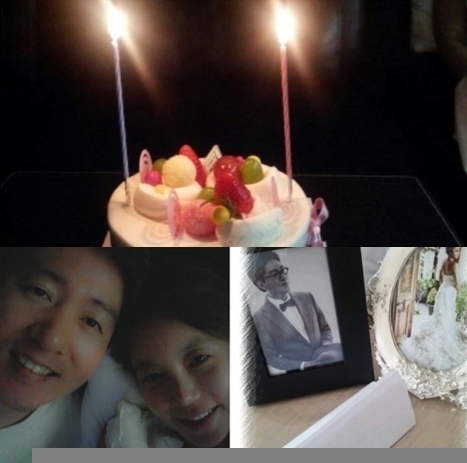 Hwang Hye Young who is the CEO of a shopping mall and was a singer as a member of TWO TWO opened pictures of her second wedding anniversary. She posted on her Facebook "Second wedding anniversary last October 23, 2013. I celebrated it in a small way by pregnancy, but it was happy" "My husband gave a letter handwritten on an A4 size paper to me as he couldn’t prepare a pretty card. I cried with joy. He always says that I’m the first" she expressed how she felt. And “I appreciated that you are my husband and a father of my babies who will be born soon. I love you and I love you and I love you.” she posted with pictures. She opened pictures together with her husband seeing a camera face to face and a cake, letter and a framed wedding picture and many others. She expressed everlasting love for one another. She shows off white skin and innocent face although she’s seven months pregnant and wears pajama and has a face without makeup. Meanwhile, Hwang Hye Young was married with Kim Kyung Rok who is an ex-vice-spokesman of Democratic Unionist Party last October, 2011.